Since 1814, WÜSTHOF premium knives have been cherished around the world by restaurant chefs and avid home cooks. Having celebrated its bicentennial in 2014, the family-owned and managed company continues to pay homage to its unparalleled heritage in crafting cutlery of outstanding quality and precision. All WÜSTHOF knives are made in the company’s eco-friendly facilities in Solingen, Germany. WÜSTHOF’s precision-forged and full-tang knives include several collections, such as CLASSIC, CLASSIC IKON, GRAND PRIX II and EPICUREAN. Also popular is GOURMET, a collection of high quality, laser-stamped, full-tang knives. All WÜSTHOF precision-forged knives include the company’s patent-pending Precision Edge Technology (PEtec). Using guided, state-of-the-art lasers and exclusive technology, WÜSTHOF premium knives are now 20 percent sharper, and maintain their edge for twice as long. WÜSTHOF’s executive chef Michael Garaghty (a.k.a., Chef Mike – shown above) travels across the country teaching consumers knife skills, and proper use and care of premium knives. Chef Mike will be at the Seattle Food and Wine Experience to meet attendees and guide them in choosing the right type of knife for the task, and how to use proper techniques working with essential knives for everyday cooking, such as an 8-inch Cook’s knife, Asian-style Santoku and Nakiri knives, paring knives, utility knives, serrated bread knifes, and more. Chef Mike will also demonstrate numerous ways to hone and sharpen knives at home. 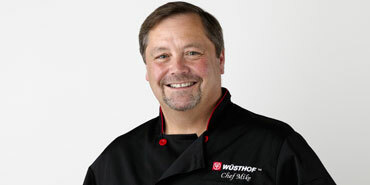 Visit WÜSTHOF at the Seattle Wine and Food Experience to meet Chef Mike, and purchase WÜSTHOF knives at special savings offered exclusively to attendees.